Ontario’s new government and auto insurance regulator are “focussed on the right areas,” a senior manager for the province’s largest auto insurer said recently. The FSRA budget and priorities document is “very much in synch around streamlining rate regulations, supporting auto reform strategy and developing fraud reduction strategies,” Darren Godfrey, senior vice president of personal lines for Intact Financial Corp., said recently. “The discussions we have had to date, both at the political level and the staff level have been very encouraging,” Godfrey said Feb. 6 during an earnings conference call. 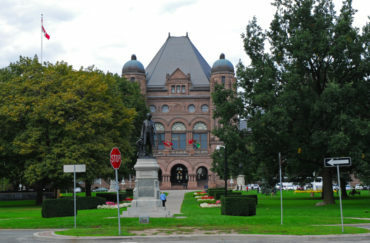 “They are very open to understanding the issues that the industry is facing, but also the impact it has on Ontario drivers,” Godfrey added in reply to a question from an analyst about Ontario auto insurance reform. Intact led the Ontario auto market in 2017 with 16.5% market share, slightly ahead of Desjardins and Aviva, according to the Canadian Underwriter 2018 Statistical Guide. The Progressive Conservative government has not specifically said whether it will implement any recommendations from the 2017 Marshall report on auto reform, other than measures that were already in the works, such the rollout of FSRA. Marshall, a former CEO of the Workplace Safety Insurance Board, was appointed in 2015 as a special advisor to Charles Sousa, then the Liberal finance minister. The Liberals were replaced as ruling party by the Progressive Conservatives in the June, 2018 election. Marshall’s recommendations were aimed mainly at reducing the amount of money spent, in disputed auto injury claims, on dueling medical assessments and lawyers. During their 15 years in power, the Liberals brought in several major reforms, including the minor injury guideline, a new definition of catastrophic impairment, a reduction in mandatory accident benefits coverage and a new dispute resolution system under the licence appeal tribunal. For their part, the progressive conservatives said this past November they plan to work with FSRA to review how auto insurance rates are regulated. They also launched an online consumer survey in January, in which Ontarians are asked a number of questions, such as whether postal codes should be a rating factor. Some insurers argue that right now in Ontario, it is sometimes too difficult to get approval for rate increases necessary to make a profit. Rate change approvals from FSCO take too long, some insurers say. In its 2019-20 budget and priorities document, FSRA says it will have a “principles-based” regulatory approach. FSRA was originally expected to be up and running in April, but the “target launch” is now June. Senior officials include executive director of auto/insurance products Tim Bzowey (former head of home and auto insurance at RBC Insurance) and CEO Mark White, former senior vice president and head of enterprise risk at the Bank of Montreal. We need action now not talk! We are ina crisis!